The Official Guide is your must-have study guide that features Verbal, Quantitative, and Integrated Reasoning questions types. New to this edition is exclusive access to the online question bank that allows you to create practice tests from the over 900 retired GMAC questions featured in the book, as well as exclusive videos from real test takers and GMAC staff who share insight and tips on GMAT preparation. 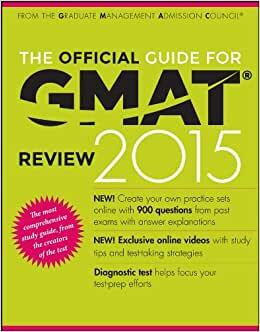 The Official Guide for GMAT Review 2015 features 900 practice questions of all types with answers and explanations, math review, essay topics, and a diagnostic test. In addition, you have access to a new online study companion that includes the same practice questions and Integrated Reasoning questions and answer explanations; 100-question diagnostic exam to help focus your test preparation efforts. 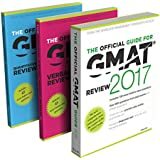 The preeminent source of practice questions, The Official Guide for GMAT Review 2015 helps you identify areas of strength and customize your study plan.